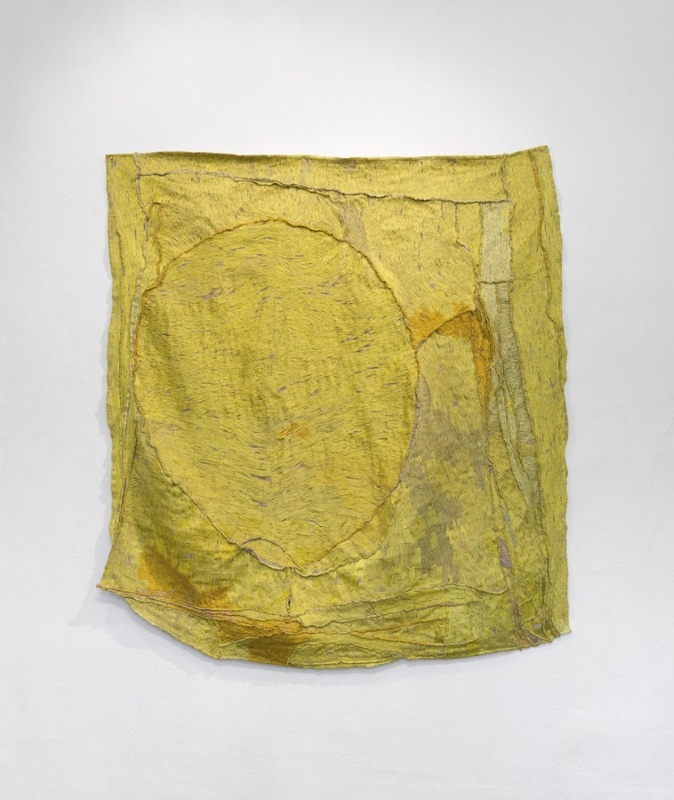 Teelah George, Australia, born 1984, The Persistent Yellowing (time piece), 2016, cotton thread, linen, bronze, 170 x 157 cm. Installation view, Art Gallery of South Australia, The Ramsay Art Prize 2017. Photo: Saul Steed. Days tick by slowly when you’re chronically ill. Too sore to exercise beyond slow walks around the block, too dazed to concentrate on work, too exhausted to do more than care for your health. Many days are spent moving between bed and couch, counting the minutes until more pain relief can be taken. Minutes and then hours pass, bruises fade, wounds heal, scars mellow. Perhaps the part I find most unfair is all the time to think with no ability to put anything into action. My attention is constantly drawn inward out of necessity of treatment — monitoring pain levels, side effects of drugs, hours of rest — and it is hard to find perspective. A few weeks after my most recent endometriosis-related surgery I was in pain, and walking gingerly, but in desperate need of an aesthetic distraction. I had heard wonderful things about the Ramsay Art Prize of 2017, exhibiting at the Art Gallery of South Australia, so I drifted down the tree-lined promenade of North Terrace hoping the exhibition would release me from of my own thoughts for an hour. Instead, the works of several finalists burrowed their way into my head and I’ve thought about them for weeks since. Coincidentally or not, three of the works in the exhibition managed to say things about my pain and my relationship to it that I was as yet unable to articulate myself. Together they form a perfect expression of my pain, its aftermath, and the beauty and reflection that can come from it. These three works each have meanings beyond my own of course. None were created with chronic illness in mind, but all three do point to visibility, challenge and the self. Henry James once wrote ‘in the arts, feeling is always meaning’. I don’t presume to erode the artists’ meanings, I simply wish to add my reflections to the lens. Because to see my pain is to see myself. Owen Leong, Australia, born 1979, Sankalpa, 2016, archival pigment print on cotton paper, 120 x 120 cm; Courtesy of the artist and Artereal Gallery, Sydney. I rub my swollen belly as I board the tram, hoping someone will think I’m pregnant and give up a seat. I hold my aching lower back as I walk down a busy city street, praying that the crowds will give me a slightly wider berth. I return to my desk with a wheat bag carrying the faint scent of warm bread and a cup of peppermint tea for the nausea, hoping my colleagues recognise that I am fighting hard to be there. I see the crutches and supports holding me up, even if no one else can. My illness is invisible to the outside world. I often wish there was an external disfigurement that proved my pain to others. Owen Leong’s Sankalpa uses photography and sculpture to question the framing of the body. In this self-portrait his neck is supported by a medical brace, while his head is surrounded by a bronze prism which appears architectural yet playful. It looks as if the neck is taking the weight to free the mind in order to roam. While my pain has been burning away at my centre, often taking my legs out from under me, my mind has been almost hyperactive. My kitchen table is littered with notes and lists to record all of these ideas before the painkillers inevitably dull my brain back into a meek silence. Leong’s use of the Sanskrit title of his work, meaning ‘a deep resolve or intention to bring about positive change in one’s life’, speaks to me of the drive to reframe my illness despite days where this feels impossible. When the searing pain has me doubled over, or in tears, or lying awake for hours, all I see is the pain. I just wish others were able to see it too. A large work made from embroidery and bronze, crosshatched and interwoven, The Persistent Yellowing (time piece) by Teelah George was amassed over a five-month period. It’s a durational work that speaks of entropy. The intricate texture of this piece feels like the small scars I wear both inside and out. Each failed medication, each set back, each sleepless night, they all weave together. Not all the strings on this piece are visible on first viewing. But if you keep returning, keep looking, more and more layers come to the surface. I’m reminded of my mother holding me, even now well into my thirties, when things get bad. Just like when I was a child, pulling me onto her shoulder, slowly stroking my hair, promising things will get better. Layers are not always transformative — sometimes they are just an accumulation of experience, not a movement to an end. Recently I told a dear friend I was hesitant to begin dating again after my most recent surgery. I was self-conscious about the scars and bruises, I was feeling vulnerable and not sure what my body could physically handle. He told me about an ex-girlfriend who had a large scar from open-heart surgery. How he loved nothing more than the feeling of gently running his finger over the scar tissue, feeling every jagged cut and stitch. The surgery had opened her to the world and made her vulnerable, but ultimately it made her stronger and sexier. This friend made me see that these small scars that dot my abdomen reveal my vulnerability but they also display a strong resolve. As I stood in front of The Persistent Yellowing (time piece) I found myself constantly resisting the urge to run a fingertip down the stitching. I hope that in time I find someone who sees the beauty in my own intricacy. Justine Varga, Australia, born 1984, Antidote, 2016, chromogenic photos, dimensions variable; Courtesy of the artist and Hugo Michell Gallery, Adelaide. The psychedelic colourings of Justine Varga’s works — caused by exposing film to light for periods of months or years, then drawn on, handled, scratched, spat on and weathered — feel like a visualisation of my pain attacks. My body sharply caves in on itself, and like a bad trip I feel my body warp and contort, but from the outside I just appear to lower my head, wincing. Varga describes the collection as ‘ravaged memorials to lived experience’. My body is a walking memorial to the internal ravaging my illness has caused. My medications give me vivid dreams. The colours are bright and the faces are clear. Recently I dreamt of my childhood front garden and felt the texture of the grass as my brother and I ran across it bare foot. I heard the faint traffic and lawn mowers of suburbia in the background. I could feel the mist of the recently watered plants, the scent of the jasmine as the sun hit its flowers, the texture of the rose bushes as I touched a single large petal, the exact colour of the camellia bushes that lined the front fence. Varga’s works display a slow decay, but they also reveal an exquisite beauty. My pain may have me regressing into childhood, but it reminds me of all the colour and joy that being open to the world brought me. And it reminds me of the only time in my life when I was pain-free. Pre-pubescent life should be a time of innocence for all children, and I’m grateful every day that I rode my bike whenever I could, that I threw my body across the netball court, that I raced my little brother down the street. I’m grateful I made the most of that time and didn’t hold myself back. Maybe those memories are the bursts of colour in Varga’s works, not the hot spots of pain as I originally saw them. Whatever they represent they are cause for reflection and an exploration of beauty, and I will forever be grateful to my illness for bestowing the same to me. Kylie Maslen is a writer and events producer in Adelaide, South Australia.